Dave Stanley, Sevierville, Tennessee, has completed his 1936 120B 4-door sedan except for upholstery. Pictures of Dave’s Packard can be seen in Members Photos. The sedan has a trunk rack and Dave has a trunk to install on the rack. But these Packards have a built-in trunk which you can’t open with the removeable trunk mounted on the rack. 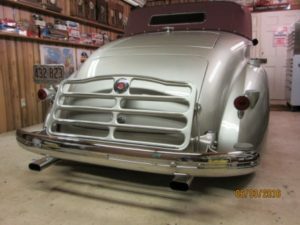 I know this may sound confusing to Packard owners who do not have a trunk rack, but my 1937 convertible has the same problem. It has a rumble seat, a trunk which holds a spare tire, jack and lug wrench and a trunk rack. I have to fold the rack down to get the trunk open to get my spare tire out. So the question is how do you attach a trunk to the rack and still have access to the car’s trunk without removing the trunk. 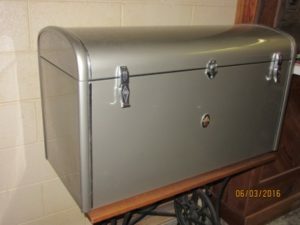 I have located the hardware which came with the Packard trunk which I bought in Hershey, Pennsylvania, many years ago. 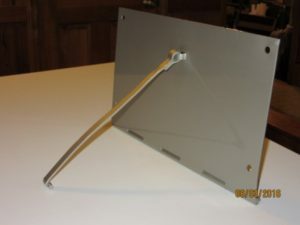 It consists of a 8 inch by 14 inch plate with a hinge on one edge and a flat bar 1 inch wide by 14 inches long. The trunk has 6 holes in the bottom, 4 on the right that line up with the plate and 2 on the left that line up with the bar. 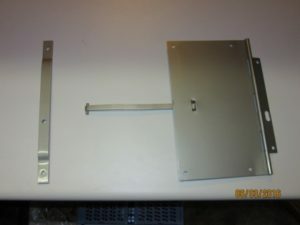 When it is all bolted together, the hinge bolts to the right edge of the rack. 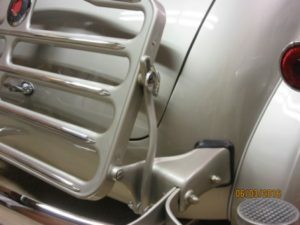 I saw one of these in Hershey and the trunk tilts to a vertical position to make room to access the car’s trunk. I have never installed the trunk on the rack, but I will include pictures of the rack and hardware to give a better understanding of how this works. If anyone has installed one of these trunks or you have seen information about how to do it, send it to me and I will post it here.